The following links will take you to web sites about the AP Program or sites that will add to the information that we are covering in class. Some of them are good study aids. You can download the AP Central Calculus AB course description at the above site. You can download the AP Central Calculus BC course description at the above site. This site contains worked out solutions to past free response questions and information about their exam prep publications. Is math your favorite subject or your most hated topic in school? Are you looking for free online math help, math fun and other useful resources? In this site, you will find interesting quizzes, practice, homework help and other materials to keep you occupied; or fun facts, games, puzzles and other cool stuff to make this subject something to be enjoyed rather than dreaded. The Essence of Calculus: The goal here is to make calculus feel like something that you yourself could have discovered.These are a "must see"! Awesome Online Calculus Course from Ohio State University - Free! Study.com's AP Calculus AB & BC: Exam Prep course can help you quickly and efficiently get ready for the AP Calculus AB and BC exams . How to understand Calculus at a very high level. An interactive Calculus page with great notes and examples. Click under Differentiation or Integration or Higher Calculus. The web's most extensive mathematics resource. Lin McMullin is one of the most knowledgable people when it comes to what topics are going to be covered on the AP Exam. If you are wondering what types of problems to expect to see on the next AP Exam your best bet is to watch and carefully listen to the videos Lin has put together and be sure to have a pencil and paper ready to do the problems as he goes through them. This site is called Get A Five On Your AP Exam. Their services are free when I'm posting it. It may change in the future but for now they have decided not to charge for their service. They have a Study Room, Diagnostic Exam, Video Lessons and Practice Tests. It's an excellent source for reviewing all year!! Right click on downloaded folder and select "extract all ..."
Open the new folder and find the icon with a computer on a desk that is named "vti"
In order to change between the TI-83 and TI-89, press F12 and select the appropriate tab. This site has links to many, many worksheets and resources for many of the BC topics that are in a college Calculus II course. It will definitely keep you busy! "Help! I can't remember and I don't know where to look it up." This website is designed for math students who need an easy-to-use, easy-to-understand math resource all in one place. It is a comprehensive listing of formulas and definitions from beginning algebra to calculus. The explanations are readable for average math students, and over a thousand illustrations and examples are provided. This is an AWESOME resource for any math student. This site has a derivative calculator and an integral calculator if you want to check your work (always do the work first!). It even has an equation solver. It has all kinds of calculators! If you ever want to see if your calculation is right check out this site. Tutorials on a variety of topics. Here's a site with some good animated tutorials on Limits and Derivatives. This is a great source for links to practice tests and all sorts of links to other resources. Download WinPlot - The Best Free Graphing Software Available!! WinPlot is a very easy to learn powerful graphing software program that is free. It is one of the best available if not the best. IMHO. HippoCampus Home: the best stuff on the web to help you with your homework and study. Click on Calculus I for AB and II for BC. This site has information about a large variety of topics from Algebra to Differential Equations. This is the home site for excellent tutorials on several math subjects offered by Harvey Mudd College. Here's a site with all sorts of sample problems and detailed solutions to pratcice your skills. This site has many, many graphs depicting various differential and integral calculus concepts that come alive with the use of the graphing software GeoGebra which you can download from the site below, in the left column. This site has a wealth of resources sponsored by the AP Calculus teachers in the Houston, Texas area. Here's a site with a Unit Circle with trig values. It's great for practicing your knowledge of the different trig values using the unit circle as a model. Remember you can always use 45-45-90 and 30-60-90 reference triangles with sides (1, 1, sqrt 2) and (1, sqrt3, 2) as an alternative if you want. This site has examples demonstrating problems using Geogebra displaying Volumes of Solids of Revolution. Definitely worth a visit. This is the University of Texas Calculus Site with tutorials covering Limits through The Fundamental Theorem of Calculus. This is an online 3D graphing utility. Very impressive. This site has links to 101 fascinating sources of mathematics at its best. A real must see! A brief history of that number that's near and dear to our hearts: e.
This ia an excellent resource for researching the history of mathematics. It's also fun to browse and discover all sorts of interesting tidbits. It is a project from Thinkquest. You need to scroll down to 1998. Paul Dawkins' online math notes offer an entire course in calculus. They are easy to read and very worthwhile. This site is definitely worth a visit. A variety of graph papers that you can print. This site is the home of a free graphing calculator - what a deal! Awesome, awesome site with 240 websites dedicated to math out of over 8,000 websites created by students around the world who have participated in a ThinkQuest Competition sponsored by Oracle. This information is provided by the site "Affordable Colleges Online" which provides community resources and tools related to higher education with an eye on affordability and accreditation. A FREE "dynamic geometry software." Don't be intimidated if it doesn't seem intuitive at first -- it's definitely worth the effort to learn some of its basic functionality. Even for math subjects that I thought I knew quite well, I found that through using Geogebra I gained more insights and connections to other topics. A FREE web-based graphing calculator. In many ways it can be seen as an alternative/competitor to Geogebra. I got hooked on Geogebra long before Desmos came along, but new users may find Desmos to be more user-friendly. This site was suggested by a visitor from Australia to our site. It has a variety of valuable information and links that are worth a look see. If you ever wanted to go to MIT this is your chance. Just click on this link and it will transport you to a free Single Variable Calculus MIT course that's yours for the taking. Have Fun! Here's a must see site if you use a TI-89 calculator or a TI-83. We will see many video tutorials by Patrick during the year. This is a link to his main site where all of his tutorials are available. Word Arithmetic was a popular (among math nerds) type of puzzle from Dell Puzzle magazines. This is the only computerized version of Word Arithmetic that I'm aware of. This puzzle is based on long division, but if you really wanna nerd out, here's a long multiplication version too. Mobile device division version here and mobile device multiplication version here (html5 instead of Flash format). Audio may not play on phones/tablets; other functionality limited. 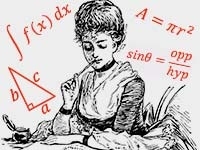 Hey all you artsy word-lovin' types, this site has HUNDREDS of poems that incorporate the language and concepts of math. I absolutely love the existence of such a vast collection of works bridging math and language. Here's another site with a similar mission!